1) What is Babicz "Full Contact Hardware" ? Babicz "Full Contact Hardware" (also referred to as "FCH") is the innovative and patented bridge-saddle technology that has been making a dramatic impact with electric guitar and bass players throughout the global music community. The 'FCH' system incorporates the Babicz "eCAM" saddle, a proprietary design that allows for maximum downward pressure on the saddle housing, which results in "Full Contact" between the string transference and the body of the instrument. 2) What are the advantages of the 'FCH' technology ? The FCH saddle provides for vastly increased dynamic range, sustain, and pitch stability by utilizing Jeff Babicz's unique “eCAM” saddle assembly, which replaces the conventional twin set screw system typically employed to transfer string resonance to the body of the guitar. The patented 'FCH' design allows for unprecedented adjustment and locking capabilities while maintaining dramatically increased string vibration transference from the vibrating string to the body of the instrument. This results in a dramatic increase of sustain, dynamic range and pitch stability. 3) Is the 'FCH' system fully adjustable ? You can now set your string height or "action" with more precision than ever before. The "eCAM" allows for instant and precise "action" adjustments while maintaining consistent contactbetween the saddle and the body of the guitar. Simply loosen the saddle locking set screw (on the left of each saddle) and then raise or lower your string height by turning the string height adjustment set screw (on the right of each saddle). Once you have set your action to your desired setting, you can tighten the saddle locking set screw. Conventional string height action adjustment set screws are eliminated, so you will never have the bridge saddle "sink" or "shift" while playing. Setting precise intonation adjustments is also easier than ever before. Simply loosen the bridge saddle clamping screw (just above each saddle) and adjust the intonation screws (at the rear of each saddle) to set the saddles to the correct position. Once set, tighten the bridge saddle locking screws. Intonation adjustments are more precise than ever before. After adjusting the extremely precise individual string height and individual string intonation settings, the entire saddle assembly then locks in place for total stability. 4) What models are currently available ? Currently "Full Contact Hardware" is available for most Fender style tremolo guitars, "Telecaster" (and hard-tail) guitars, "Tune-o-Matic" style guitars, four and five string Fender style basses as well as Gibson 3-point basses. 5) What is the difference between the "Original" and the "Z-Series" ? "Original" series Babicz bridges are made from extruded aluminum, very light weight and utilize a double locking (top and side-to-side) system for the saddle. The saddles are anodized aluminum. The "Z" series are made from steel, and have a much more 'traditional' look, and have a single locking (top) system for the saddle. Most "Z" series players are looking for the more traditional appearance. Both systems utilize the patented Babicz "eCAM" saddle technology and provide you with unmatched performance. 6) Will the "Full Contact Hardware" add any unnecessary weight to my guitar or bass ? No, the "Original Series" FCH bridges are machined from lightweight materials which are the most conducive to tonal transference, and are actually significantly lighter than conventional bridges. The "Z Series" FCH bridges use the same materials as conventional bridges so they maintain the same weight. 7) Why are these particular materials used for the "Original Series" Full Contact Hardware ? Aluminum offers the least amount of acoustical impedance when compared to most common metals, and being inherently lightweight is an additional benefit. From a performance perspective we see the Full Contact Hardware to be the final solution for tone, sustain, and sonic transference between the vibrating string and the body of the instrument. 8) Can I install the "Full Contact Hardware" myself ? Yes, the "Full Contact Hardware" system is designed as a direct replacement for traditional guitars and basses. Installation is fast and easy. 9) Is there a warranty on the "Full Contact Hardware" ? 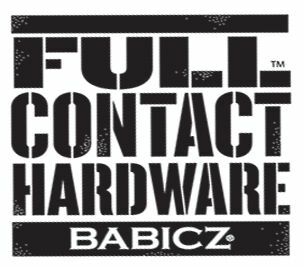 Yes, there is a three year factory warranty on the Babicz "Full Contact Hardware"
10) Where can I buy the "Full Contact Hardware" ? Currently the "Full Contact Hardware" is available through a wide variety of music retailers and distributors globally and you can always buy FCH directly from the www.fullcontacthardware.com website.